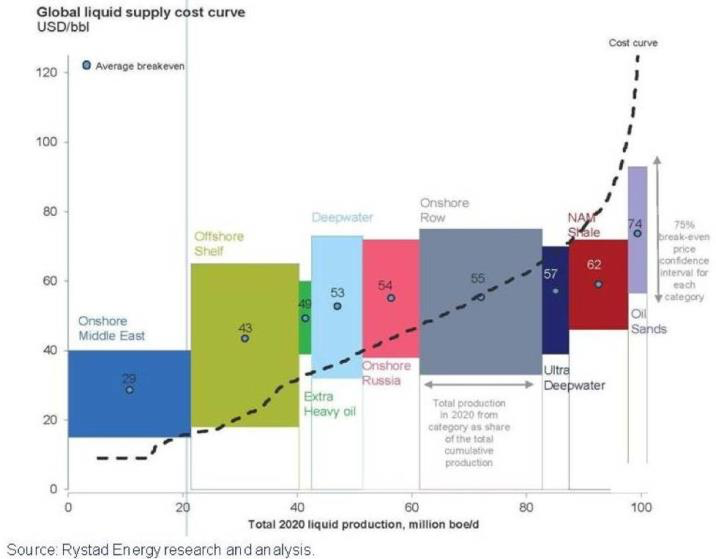 Other factors affecting oil supply costs include location of the resource in relation to the market, available transportation infrastructure (such as pipelines) and difficulty of access in terms of geography and climate. These factors certainly impact Canada. The price of oil has been so often in the news recently, this first issue of PatchWorks in 2015 is devoted to that timely and important topic. As the WTI price of oil hovers in the US $50 per barrel range (or lower), it makes sense to ask the question: Can companies still make money supplying oil at this price point? As usual, the answer isn’t a clear yes or no, but “it depends”, based on some key factors. The biggest factor is geology: the type of oil and ease of getting it out of the ground affect cost immensely. The graph below illustrates the varied cost profiles of oil producing regions around the world. Costs to supply oil vary enormously throughout the world’s oil producing regions. Looking at these numbers, it’s clear that US $50 per barrel oil is sustainable only for a select few locations and types of oil worldwide, such as onshore Middle East and offshore shelf (i.e. not deepwater). Companies in other oil producing regions – such as onshore Russia and rest of world, as well as Canada’s heavy oil and oil sands – will need to cut costs, streamline production, enhance technologies and take other measures in order to stay afloat over the long term should the current low-oil-price environment persist.